All the latest news, tourdates, discography, biography, collectors items and downloads can be find on this fanpage dedicated to John Hiatt. A new Slow Turning John Hiatt Fanzine is added to the website! Check it out here. Thanks to Sylvan! John Hiatt is set to return with The Eclipse Sessions on October 12th, 2018 via New West Records. The 11-track set is the Grammy nominated legend's first new album in four years. It was produced by Kevin McKendree (Delbert McClinton) and features Hiatt's longtime drummer Kenneth Blevins and bassist Patrick O'Hearn, as well as Yates McKendree (Kevin's 17-year old wunderkind son, who also engineered). 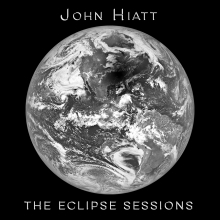 Hiatt places The Eclipse Sessions in a lineage alongside two of his greatest works -- 1987's mainstream breakthrough Bring the Family, which sprung from an impulsive four-day session with an all-star combo led by Ry Cooder, and 2000's Crossing Muddy Waters, an unplanned and largely unplugged effort that garnered a Grammy Award nomination and also set Hiatt on the rootsier path he's still pursuing today. "The three albums are very connected in my mind," Hiatt says. "They all have a vibe to them that was unexpected. I didn't know where I was going when I started out on any of them. And each one wound up being a pleasant surprise."